Spelling. Are you looking for A-Minor, A minor, D minor, Dminor, G-Minor, or Luminor? You ban iron I made; you buoyed a minor in a buoy. Turn iron I made in Ed’s drawer to hot rewards denied a minor in rut. Llew’s a wonder bassist – fellates pure women of iron I mate – yet a minor, if one mower upset all efts, is sabred now as well. What does A-Minor mean as a name of something? 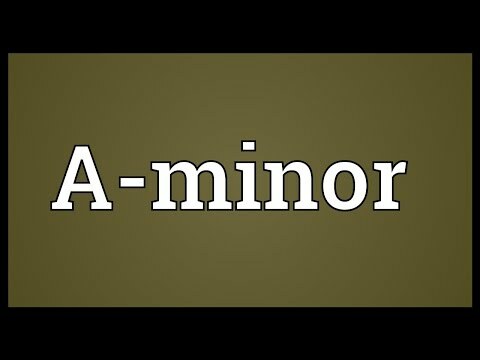 A-minor a.k.a. A minor is a minor scale based on A, consisting of the pitches A, B, C, D, E, F, and G. The harmonic minor scale raises the G to G♯. Its key signature has no flats or sharps. See also the pronunciation examples of A-Minor! Every critic--don't you know it? See also the blanagrams of A-Minor! Go to the usage examples of A-Minor to see it in context!